Ruari Owens suffered psychological injury over the incident, the court heard. A 10-YEAR-OLD schoolboy, who witnessed a horror attack on his toddler sister by a Brazilian tapir at Dublin Zoo and saw his parents injured in a bloody fight to save their daughter’s life, has been awarded €25,000 in the Circuit Civil Court. Ruari Owens, who is now aged 15, saw the female tapir, which had earlier given birth to a calf, lift his two-year-old sister, Katie, in its mouth and violently shake her, causing her serious injury. Katie’s parents Daragh Owens and his wife, Patricia, fought off the animal and were themselves injured in the attack that took place in Dublin Zoo in the Phoenix Park on 8 August 2013. Barrister Francis McGagh, counsel for the Mayo-based family, told Judge Francis Comerford today that the children had been in the tapir cage and Ruari had seen close-up the sudden and violent attack. McGagh, who appeared with Cathy McDarby, of McDarby Solicitors, Ballinrobe, Co Mayo, told the court that Ruari’s brother Cathal, who was only six at the time, had also witnessed the vicious attack. Both boys, while not physically injured, had suffered psychological injury. McGagh said the Zoological Society of Ireland, had also offered Cathal, then-aged 11, settlement damages of €25,000 but Judge Comerford said that from medical reports Cathal seemed to have been more seriously affected. He adjourned consideration of Cathal’s settlement figure until the court receives an up-to-date report. He told Judge Comerford that claims on behalf of Katie, her mother Patricia Frost, and her father, Daragh Owens, were currently before the High Court. 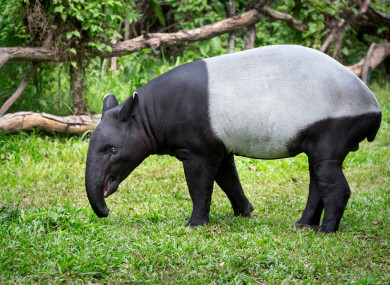 In detailed particulars of personal injury the court was told that a family friend had organised for the family to accompany a zoo keeper into the tapir enclosure. When the mother tapir attacked Katie’s mum, Patricia, dived at the animal, dislodging her daughter and covering her with her own body. McGagh, said Frost had suffered significant bite injuries and had to undergo surgery on her arm. Both parents, apart from physical injuries, had suffered traumatic psychological injuries. He told Judge Comerford that the family had also suffered trauma as a result of extensive media coverage of the incident, including a prosecution that had been taken against the Zoological Society in the District Court. “There is no doubt that the media coverage in Ireland and in Britain and in other places, including graphic pictures of injuries, greatly exacerbated the family’s psychological injuries and recovery,” McGagh said during an application to have the boys’ cases to be heard in camera. Judge Comerford, who said the unfortunate incident was already in the public domain, decided not to apply any reporting restrictions. He said the attack must have been terrifying for all of the family. McGagh made an appeal to the media to treat today’s reporting of the cases with sensitivity and asked that the family be left to get on with their lives in peace at their home in Mochara, Shrule, Co Mayo. In December 2014 the Zoological Society was prosecuted on the grounds of negligence in the District Court where the judge applied the Probation Act, thus avoiding a criminal conviction, and ordered the Zoo to make donations of €2,500 each to both the Jack and Jill Foundation and to the Laura Lynn Children’s Hospice. Graphic pictures of the injuries caused in the horror attack had been published in the Medical Journal. Judge Comerford put Cathal’s case back for a further medical report. Email “Boy who witnessed toddler sister being attacked by tapir awarded €25,000”. Feedback on “Boy who witnessed toddler sister being attacked by tapir awarded €25,000”.